Top Ten Tuesday is hosted by The Broke and the Bookish. 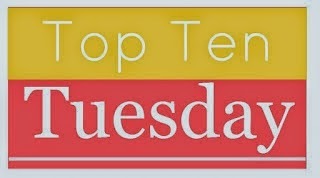 To learn more about Top Ten Tuesday or see the list of future topics click here. Even reading YOUR list stressed me out! LOL I get very stressed thinking of all the things I "should" read. But I don't stress about Murakami - I know I couldn't do it! Right?!?! It's just stressful and saddening how many hyped books and non-hyped books I haven't read yet. Should I be shocked that I have read most of what's on your list? But Trisha--really never a Murakami?? Ok so I've only read two from him but I love his books. I'm reading/listening to the 4th Outlander right now--it's like bookish candy for me. Actually, the only one I haven't read is A Discovery of Witches. I know I need to read Murakami; he sounds awesome. I haven't read a lot of these either! Gone Girl was good, if you can handle not liking any of the characters in a book. I wouldn't recommend The Lovely Bones. I really didn't like it. I made it about halfway through The Historian before giving up on it, and everyone I know who finished it said don't bother, if that helps narrow down your list at all. I've only read one Haruki Murakami myself, and I keep meaning to get to more of his work! I have read all but two; I have not been interested in the Harkness but have wanted to try The Historian someday. As to Murakami -- his stuff can be odd but it is not scary or over-the-head. I don't get why some are intimidated. Would you be interested in Norwegian Wood as a readalong? A readalong!!!! Yay!!! and yes if you didn't get it from the previous statements. I've read Outlander, The Lovely Bones, and The Historian, and they're all very good books. That being said, you'll have to be in the mood for them - namely Outlander and The Historian because they're soooo looooong. I am mildly surprised but not completely by your unread list. Some I would have expected you to read but not others based on your eclectic tastes. Out of all of them, try Outlander. And...maybe The Time Traveler's Wife. And...The Kite Runner. ok I'll stop there. I've only read 1Q84 by Murakami and never wanted to read The Lovely Bones or Five People. I've read all the others, though, some of which I liked and some of which I did not.